Spray a 13 x 9- inch (3-quart) baking dish with nonstick cooking spray and set aside. Add oil to a large skillet and heat over medium-high heat. Add chicken and stir fry for 2 minutes. Add bell peppers, onion and cilantro; stir fry for 3 to 4 minutes or until chicken is no longer pink. Remove from heat; stir in beans. 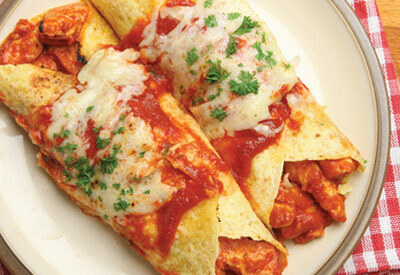 In medium bowl, combine enchilada sauce and tomato sauce; blend well. Spoon 2 tbsp of the sauce into bottom of baking dish; reserve remaining sauce. Spoon 1/2 cup chicken filling down center of each tortilla; roll up. Place seam side down in baking dish. Pour reserved sauce over enchiladas; cover. Bake for 30 to 40 minutes until thoroughly heated. Sprinkle with cheese. Let stand 5 minutes to melt cheese. Garnish with freshly chopped cilantro. To prevent tortillas from breaking apart, wrap in a paper towel and microwave for 35 to 45 seconds just before adding the filling.